Tuesday morning: Visit to Sauternes starts with Yquem, looking as grand as ever and visible at a distance on the dizzy heights of 80 m elevation overlooking Sauternes. I’ve visited Yquem twice before, once when I had the fortune to follow the Japanese ambassador, so many extra wines had been opened and were available to taste, and once with an MW group. Both of these visits were conducted by the winemaker, but with LVMH now in charge, there’s a more corporate feel to professionally managed visits with a guide. But Yquem remains at the top of its game with only the Grand Vin (no second wine: anything not used is sold off in bulk for generic Sauternes) and the dry white Ygrec (about 10,000 bottles per year). Production of Yquem varies wildly from year to year: none in 2012 and about 100,000 bottles in an average year. It was available en primeur from 2004 to 2009, but it seems that this may now have been stopped. On the highest point in Sauternes, d’Yquem is still the grandest chateau of all. Lunchtime: The connection with the Lur Saluces family, who owned Yquem until it was sold to LVMH, continues, as we go for lunch at Chateau Coutet, which was owned by the Lur Saluces family until the 1920s. Aline Baly, whose grandfather bought Chateau Coutet in 1977, tells us there used to be stories about a tunnel between Yquem and Coutet. From Coutet in Barsac you can just make out Yquem at a point of elevation on the horizon, but that would be some tunnel! Over lunch we try Opalie de Coutet, the dry white wine that was introduced in 2010. “It’s not made by making a general first pass of the vineyard,” Aline explains, “but from specific rows in certain parcels on the best terroirs which are now dedicated to making a high quality white wine.” Coming from an equal blend of Sémillon and Sauvignon Blanc, it shows quite a rich style. “Opalie is a great way to explain that sweet wine isn’t just sugar, there is terroir here,” says Aline. It’s an interesting introduction to the wines of Coutet, but I’m not sure how much impact it will make on the market as production is very small, only 3-4,000 bottles. The Coutet 1998 and 2003 make an interesting contrast, the first with a nice savory counterpoise to the sweet fruits, the second overtly decadent from the very hot vintage. Afternoon: Chateau Climens is almost adjacent so we actually make our first afternoon appointment almost on time. Technical Director Frédéric Nivelle explains that he and proprietor Berenice Lurton have been converting to biodynamics. This is no mean feat in a climate as humid as Bordeaux. “The vines show improvement very quickly, but it’s slower to show in the wines,” Frédéric says. 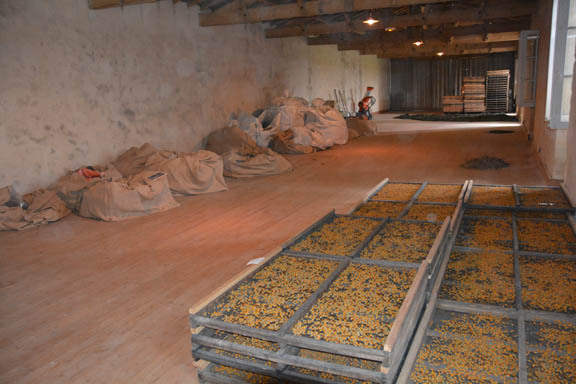 They make their own preparations to spray on the vines, and there’s a loft full of dried herbs. The intensity of the chamomile puts most chamomile tea entirely to shame. Chateau Climens is committed entirely to Sémillon. When M. Lurton bought the chateau in 1971, there was only a little Sauvignon Blanc, and it never gave good enough results to include in the Grand Vin, so it was uprooted. Since then, Climens has been 100% Semillon. There’s only the Grand Vin and the second wine, Cypress de Climens. “Some second wines come from young vines, inferior plots, mechanical harvesting, and have shorter aging, but it’s not like here,” Frédéric explains. The second wine comes entirely from tasting barrels to decide which should go into the Grand Vin and which into the second wine, so it isn’t a question of level of botrytis, but one of style. Late afternoon: Final visit of the day is back over to Sauternes, to Chateau Suduiraut, now owned by insurance company AXA. Technical director Pierre Montégut sees his job as making wine that will make people want to drink more than one. “I hate the half bottle in Sauternes,” he says, “I would like to bottle everything in full bottles. I want people to be able to drink more than a glass, they should be able to finish the bottle.” The tactic here is to have a range of wines in different styles. “Castelnau de Suduiraut was created in 1992 as a second wine when there was no Grand Vin, and was a classic second wine, resulting from declassification, until 2001 when we decided to make it separately,” explains Pierre. Then in 2009 the half of production that was Castelnau was split again, with half going to Lion de Sauternes, a lighter fresher style intended to appeal to younger consumers. For all that, my favorite at the tasting was the 2001—full force in the botrytized style. 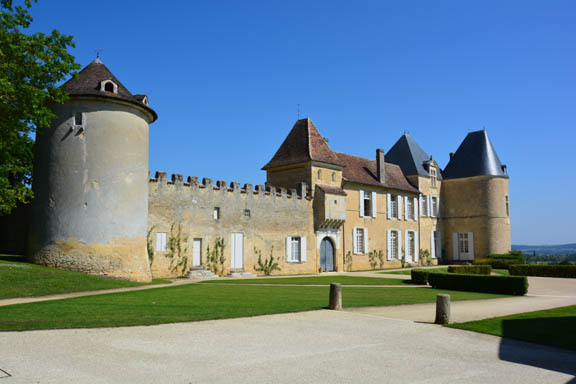 Wednesday afternoon: We close the circle with a final visit to Chateau de Fargues, which Alexandre Lur Saluces has been restoring to glory since he left Chateau d’Yquem in 2004. The chateau is a true medieval fortress, built in 1306, destroyed in 1687, and now being rebuilt. Alexandre shows us over the fortress. “I restored everything at Yquem, and then I started again when I came here in 2004,” he says. This is a massive undertaking: at one end the walls have been rebuilt, stone by stone, but still have a derelict appearance, open to the sky; at the other end there is a roof and the interior has been rebuilt and refurbished. Expected completion date is year 2050. A modern chai has been built besides the chateau, where the production of this jewel of a property is vinified—yields are about 1000 bottles for each of the 15 ha in a good vintage. 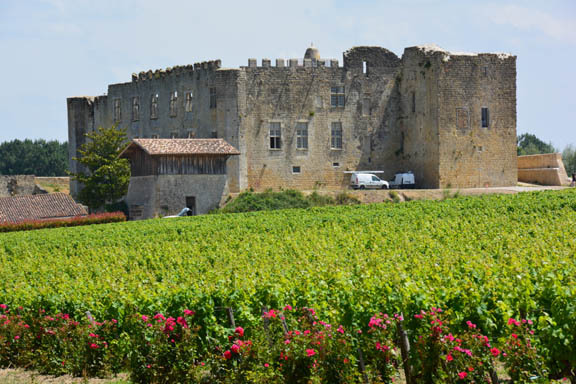 In 2012 there was no Chateau de Fargues as it wasn’t considered good enough. “It’s expensive not to make a vintage but it’s even more expensive to lose your reputation,” Alexandre says. We taste the 2006 vintage, which is sublime: subtle is not a word I often use to describe Sauternes, but it’s all lightness of being, balancing botrytis, sweetness, acidity, fruits. 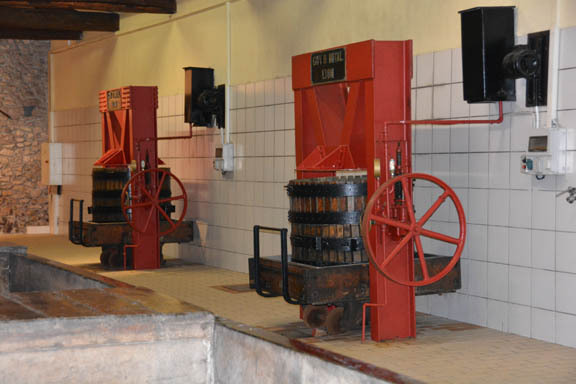 De Fargues was not classified in 1855 as the property was making only red wine at the time–the production of Sauternes started here in 1943—but it would be right at the top in any current classification. There is no second wine, some experiments with dry white wine have stopped, so there is only one wine: Chateau de Fargues. “I want to continue the family tradition of making top quality Sauternes,” is Alexandre’s position. Conclusions: For all the talk about declining worldwide interest in sweet wines, the top chateaus of Sauternes remain pretty committed to their traditional styles. There’s a broadening of many the range at most chateaus, but the much touted move to more production of dry white wine doesn’t seem to be a major factor yet. The fact that it has to be labeled as AOP Bordeaux isn’t really seen as a problem, as the brand name of the Chateau is seen as more important. The move to allow it to be labeled as Graves is seen as somewhat irrelevant. “We are in the middle of Graves, it’s just a French stupidity (to have to use Bordeaux AOP), but it takes a long time to change things here,” says Pierre Montégut. It’s a historic accident resulting from a squabble about appellation definitions in the 1930s. But nothing can detract from the unique style that is Sauternes.